Approval was obtained from our institutional review board. The study was carried out on 100 positive bacteriological cultures of medical devices, which were inserted in hospitalized patients. Isolates derived later from the clinical laboratory for the purpose of our study were frozen in nutrient broth with 15% glycerol at -20°C. Samples retrieved for the study were grown on blood agar plates and were processed as described below. Cultures retrieved from the frozen material retained the same biochemical reactions, confirming that no alteration had occurred in bacterial isolate because of storage and processing. 3 different media were taken; tryptic soya broth, tryptic soya broth with 0.25% glucose and tryptic soya broth with 0.5% glucose for culture. Isolated colonies were inoculated and incubated for 24 h in these media then cultures were diluted 1:200 with respective fresh media. Wells originally containing uninoculated medium, non-biofilm-producing bacteria and known-biofilm-producing bacteria were used as controls for cutoff, negative controls, and positive controls, respectively. The test was carried out in quadruplicate, results were averaged and standard deviations were calculated. Fifty-nine endo-tracheal tubes, 11 CVP tips, 10 Foley's catheter tips, 7 abdominal drain tubes, 5 nephrostomy tubes, 4 Tracheostomy tubes, 3 D.J. stent tips, and 1 SPC tip were included in the study. Out of total 100 bacterial isolates-23 Acinetobacter baumanni, 23 Pseudomonas aeruginosa, 20 Klebsiella pneumoniae sub spp. pneumoniae, 16 E. coil, 9 Coagulase negative Staphylococci, 4 Enterobacter cloacae, 3 Enterococci , and 2 Staphylococcus aureus were isolated details of which can be seen in [Table 1]. Out of 100 clinical isolates tested, 88 were found to be biofilm formers by microtiter plate method. 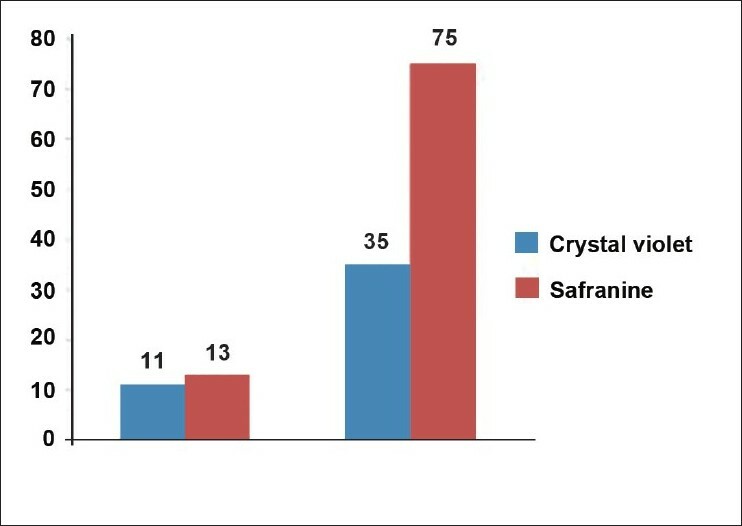 Out of two different staining methods; 0.1% safranine had detected 88 biofilm producers while 0.1% crystal violet had detected 69 biofilm producers as seen in [Figure 1] and [Figure 2] had described ability of two different stains in of detetection biofilms. [Table 2] had shown different bacterial species capable of making biofilms. Biofilm formation in response to different concentrations of glucose was studied. Tryptic soya broth without glucose showed biofilm formation in 75 (85%) isolates. Out of 75, 2 were strong and 28 were moderate biofilm formers as shown in [Table 3]. In tryptic soya broth with 0.25% glucose, 81 (92%) were found positive, of which 3 were strong and 30 were moderate biofilm formers. In tryptic soya broth with 0.5% glucose, 67 (76%) were found positive, out of which 4 were strong and 28 were moderate biofilm formers. Biofilm formation at different incubation time periods was studied. At 16 h incubation period, 88 (100%) were found to be positive, out of it, 3 were strong and 28 were moderate biofilm formers. At 20 h incubation period, 81 (92%) were found positive, 2 were strong and 36 were moderate biofilm formers. At 24 hour incubation period, 76 (86%) found positive, 4 were strong and 29 were moderate biofilm formers. Experiment was done in quadruplet and repeated two times. All OD 492-630 mm values were expressed as average with standard deviation. Indwelling medical devices are frequently used in all health setups, whereas critical care units of hospitals use multiple medical devices for treatment and intervention in patient care. Endotracheal tube amounting more than 50% of our specimen; may be due to more specimens are from patients admitted in critical care, which were either incubated or needing ventilator support in multispecialty hospitals. Second most common specimen for investigation was central venous catheters (CVCs) amounting 12% of total specimen volume under study. CVCs pose a greater risk of device-related infection than does any other indwelling medical device, with infection rates of 3-5%. Catheters may be inserted for administration of fluids, blood products, medications, nutritional solutions, and hemodynamic monitoring. Twelve percent of the specimens were of urinary catheter for our study. Urinary catheter was used for many indications in hospital, such as to measure urine output, collect urine during surgery, prevent urinary retention, or control urinary incontinence. 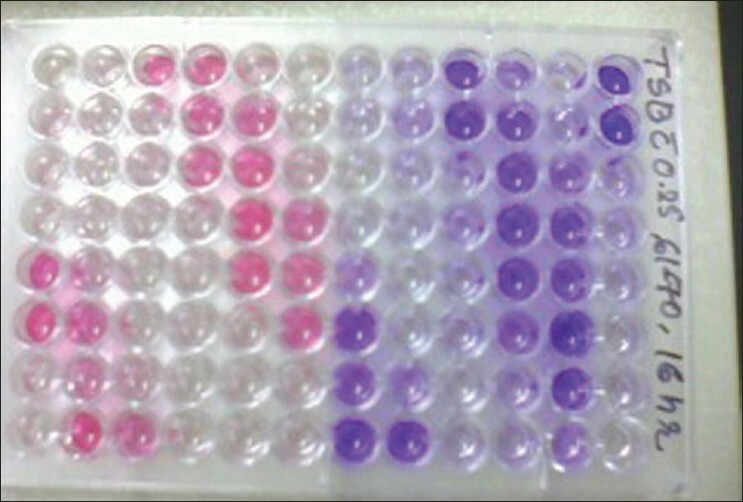 Out of the two different staining methods, safranine 0.1% and crystal violet 0.1%; safranine staining gave more positive, stable, and accurate results in terms of reproducibility, for both, gram-positive as well as gram-negative bacteria. Twenty hours incubation time was found to be optimum for detection of biofilms produced by bacteria. Moderate-to-weak-biofilm-producing bacteria although do attach to the surfaces, detachment occurs early because of weak binding. Strong biofilm producers can be detected even at 24 hours of incubation period. Availability of nutrition favors biofilm formation by bacteria so glucose enhances biofilm-forming ability of bacteria but effect of osmolarity and pH cannot be ruled out on biofilm formation. 1. Donlan RM. Biofilm Formation: A Clinically Relevant Microbiological Process. Clin Infect Dis 2001;33:1387-92. 2. Donlan RM. Biofilms and Device-Associated Infections. Emerg Infect Dis 2001;7:277-81. 3. Hola V, Ruzicka F, Votava M. The dynamics of Staphylococcus epidermis biofilm formation in relation to nutrition, temperature and time. Scripta Medica 2006;79:169-74. 4. Stepanovic S, Vukovic D, Jezek P, Pavlovic M, Svabic-Vlahovic M. Influence of dynamic conditions on biofilm formation by staphylococci. Eur J Clin Microbiol Infect Dis 2001;20:502-4. 5. Deighton MA, Balkau B. Adherence measured by microtiter assay as a virulence marker for Staphylococcus epidermidis infections. J Clin Microbiol 1990;28:2442-7. 6. Gelosia A, Baldassarri L, Deighton M, van Nguyen T. Phenotypic and genotypic markers of Staphylococcus epidermidis virulence. Clin Microbiol Infect 2001;7:193-9. 7. Dunne WM Jr, Mason EO Jr, Kaplan SL. Diffusion of rifampin and vancomycin through a Staphylococcus epidermidis biofilm. Antimicrob Agents Chemother 1993;37:2522-6. 8. Raad II, Sabbagh MF, Rand KH, Sherertz RJ. Quantitative tip culture methods and the diagnosis of central venous catheter-related infections. Diagn Microbiol Infect Dis 1992;15:13-20. 9. Rao RS, Karthika RU, Singh SP, Shashikala P, Kanungo R, Jayachandran S, et al0. Correlation between biofilm production and multiple drug resistance in imipenem resistant clinical isolates of Acinetobacter baumannii. Indian J Med Microbiol 2008;26:333-7. 10. Rossi BP, Calenda M, Vay C, Franco M. Biofilm formation by Stenotrophomonas maltophilia isolates from device-associated nosocomial infections. Revista Argentina de Microbiología 2007;39:204- 12. 11. Jayanthi M, Ananthasubramanian M, Appalaraju B. Assessment of Pheromone response in biofilm forming clinical isolates of high level gentamicin resistant Enterococcus faecalis. Indian J Med Microbiol 2008;26:248-51. 13. Stickler DJ. Bacterial biofilms and the encrustation of urethral catheters. Biofouling 1996;94:293-305. 14. Eftekhar F, Mirmohamadi Z. Evaluation of biofilm production by Staphylococcus epidermidis isolates from nosocomial infections and skin of healthy volunteers. Int J Med Med Sci 2009;1:438-41. 15. Christensen G, Simpson W, Younger J, Baddour L, Barret F, Melton D, et al. Adherence of coagulase-negative Staphylococci to plastic tissue culture plates: A quantitative Model for the adherence of staphylococci to medical devices. J Clin Microbiol 1985;22:996-1006.